I have got social visit pass only 2months in Singapore and thence I proceed my trip to Bangkok on 8th September with Air Asia(So cheaper lah). 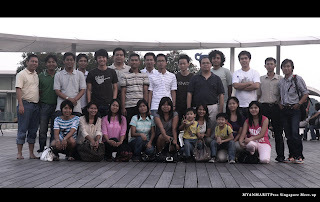 Now I am in Bangkok and ready to join My previous Company-Boss's wife(Aunty Mie)'s Birthday party on 10th September at Siam Niramit, Bangkok. During 2month stay in Singapore, I have visited to many places like Handerson Waves(already posted it and while its posted just two times but actually so far even 4times heehe), Orchid Garden, Esplande, Bird Park, Sentosa, East Coast, Habourfront(Vivo City), and so on. As I think, I just left to visit Singapore Zoo, Singapore Eye(flyer) and dining in cable car. Very nice trip in Singapore and did enjoy too much. Watching film(Red Cliff), shopping a lot, trying local foods, eating famous cuisines are included in my recreation and leisure. For adventure, starting arrival, riding MRT and buses because I used to lose my ways and take opposite direction. 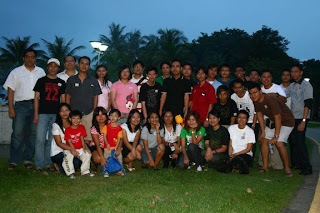 I also participated and enjoy two meet-up with Myanar IT professionals and Myanmar Bloggers in Singapore. Glad to know that you enjoyed Sg. I like the photo of you in Orchid Gardens the best. Enjoy your next leg of tour in Krung Thep (that's how the locals refer 'Bangkok' as). Waiting to read more about your travels.